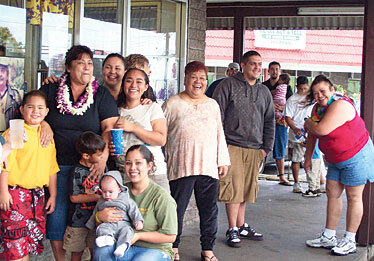 Present and former employees of Verna's food stand in Keaau hammed it up for a photograph yesterday. Owner Crystal Ah Yo is in the black shirt with leis at left. The diner closed down yesterday but will be relocated nearby. KEAAU, Hawaii » Verna's can. The locally owned Hilo-area fast-food chain is famous for its local-style sign: "If no can, no can. If can, then Verna's." It's famous for its fried chicken and its gravy cheeseburger. And now it's temporarily famous for closing its original food stand in Keaau, south of Hilo, after 25 years. As the Keaau staff handed out free chili and hot dogs yesterday on the final day of operation, owner Crystal Ah Yo grinned and said, "One door is closing. Another is opening." Building owner Jerry Nagakura found the Keaau facility too expensive to maintain on land owned by W.H. Shipman Ltd., Ah Yo said. But Shipman itself has promised to construct a brand-new building for Verna's on the company's land just a few hundred feet away. Ah Yo expects to move in by the end of the year. The original Verna's was opened by Verna Miller in 1983. It was the same year that Kilauea volcano began its 25-year series of eruptions, said Ah Yo, Miller's daughter. It was also an era when everything in Keaau closed at 6 p.m. There were no "big box" stores in Hilo. But there was a feeling of family and compassion at Verna's. Employees saw that some people would just hang around, hungry, hoping for something to eat, Ah Yo said. Verna's would send out a bowl of stew or chili and give it to them free, she said. Customer Kevin Kasparovitch praised the uniformly tasty fried chicken at the three Verna's sites, now temporarily reduced to two. "It's sweet, delicious, consistent," he said. Customer Makanani Kaaua said people bring Verna's gravy cheeseburgers on plane rides. "You can't take yogurt but you can take gravy cheeseburgers," she said.